Please excuse me while I die from embarrassment, but I have had to append an erratum to my previous post. Whether this rises to the level of scientific misconduct is something that y'all can discuss amongst yourselves, but aside from the destruction of a major city in a nuclear fireball, the damage was pretty much contained. I might just go back to posting pictures (or nothing) for a while. OK, loyal readers, it is Saturday night, and those of you without small children should be out watching action movies or something. If you aren’t lets pretend you are, just for this blog post. In the action movie that you aren’t watching right now, the heroine and her hippy dippy sidekick are trying to stop Islamic terrorists from detonating a home-made nuclear bomb on the Washington Mall, where it would damage the astounding geological collection of the Smithsonian*. Our intrepid duo manages to break into the bomb inside the terrorist safe house, but they are unable to dismantle or remove it before they have to clear out. In a fit of desperation, our heroine yanks off the sidekicks hippy dippy tourmaline necklace, and lodges it between the subcritical spheres (terrorists don’t have the engineering savvy to build an implosion device), in hopes that the tourmaline will stop the neutrons. As our intrepid duo makes a dash for their getaway combi, you all, being sensible nuclear geochemists, ask yourselves: Is that realistic, or crap? 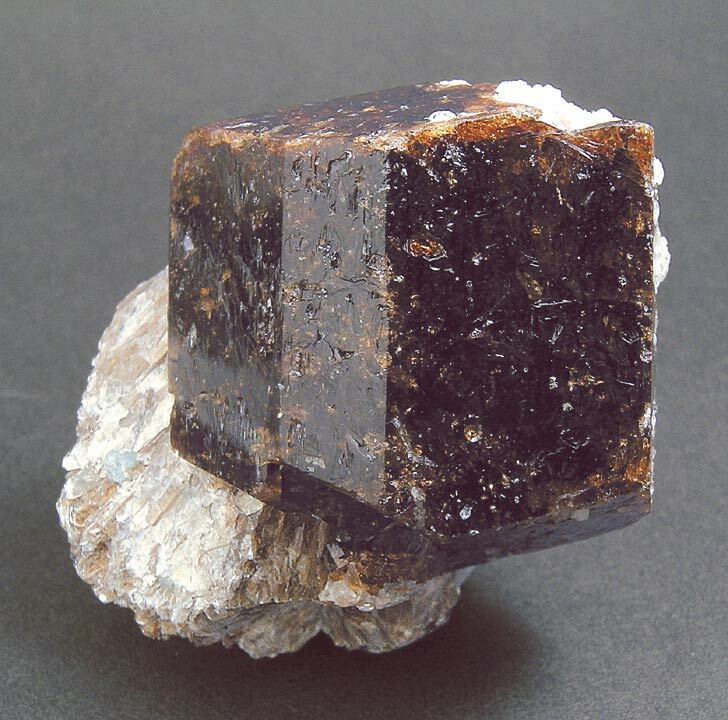 Qualitatively, tourmaline contains structural boron, which is a decent neutron absorber. Using diamonds would have been crap, of course, but our sidekicks socio-economic and cultural background might have saved us there. Fortunately, your movie theatre is equipped with envelope backs. What is the relationship between the neutron capture cross sectional area of the boron and the crystallographic structure of the tourmaline? Let us look at the basics. The simplest tourmaline compositional endmember is dravite: NaMg3Al6(BO3)3Si6O18(OH)4 (don’t ask about the complicated ones). Assume that the neutron capture cross section of everything except 10B is zero. There are three formula units per unit cell, so that will be 9 boron atoms. Boron is 19.9% 10B, so 9 x 0.199 = 1.791 10B atoms per unit cell. Great. How well does it stop neutrons? The 10B neutron capture cross section is about 3825 barns. What is a barn? 10-28 square meters, or 10-8 square angstroms. So ignoring any overlap, our unit cell of tourmaline should have 3825 x 1.791= 6869 barns, 6.8x10-25 square meters, or 6.8x10-5 square angstroms. How big is the unit cell? Since our envelope has access to webmineral.com, we can get the crystallographic information for trigonal dravite. And it turns out that the unit cell is 7.2 angstroms high, with an area of 220 angstroms. So the cross sectional area (per unit cell) of 6.8x10-5 divided by 220 square angstroms gives us a ratio of 3.12x10-7. Roughly speaking, that is the fractional change of the neutron being adsorbed per unit cell. One part in 32 million. It is not a very large number. Luckily for us, though, our hippy dippy sidekick is not a Transmission Electron Microscopist, so his necklace is not thinned down to a few unit cells. Our 7.2 angstrom C axis means that a 1 mm length will have 1.39 million unit cells in it. Multiplying that by our chance per cell, we get 1.39x106 x 3.12 x 10-7 = 0.43. So 1 mm of tourmaline should block a bit less than half the neutrons. A bit of internet shopping** says that a 50 buck pendant will be on the order of 10x40 mm, so it should actually be a fairly effective neutron shield. The bomb will fizzle, the world will be safe for geologists and hippies, and y’all can enjoy the rest of your weekend. It has been pointed out to me that the thermal neutron capture cross section is not appropriate for fast neutrons that occur in a nuclear weapon (it's a bomb, so there is no time to slow the neutrons down to a nice speed). As a result, the effective cross section of boron in this situation would be much smaller (less than a barn), and there would be minimal fission inhibition. I apologize for vaporizing whomever was in DC last weekend. But as we watch the mushroom cloud drift slowly across the Potomac, it is worth using this interlude as a teaching moment. The attraction of inter-disciplinary research is that applying techniques and approaches from an established subfield to other unrelated subfields can often result in rapid progress. However, one has to be careful, because as a newcomer to a particular subfield, there may be common traps or problems which which you are unaware. Left undetected, these can have catastrophic consequences. * Disclaimer. I had a brief post-doc there. ** Note that in addition to the hippy dippy placebo effects, the online crystal monger does not mention that tourmalines are effective shielding against thermal neutrons. They don't know what they're missing. When submitting manuscripts to many journals, there is an opportunity to suggest reviewers for the manuscript. I have found that failure to do so can result in one or more reviews where the reviewer obviously had no idea what the heck was going on. However, as I have never suggested anyone as a reviewer, I’m not really sure how this works. Specifically, if one is to suggest a particular person as a reviewer, should one ask that person first? On the one hand, asking someone to review a paper is dobbing them in for a considerable amount of work, and asking for a review without prior contacts seems a bit like listing someone as a personal reference without asking. ON the other hand, the peer review system is supposed to be anonymous (you in the back, stop laughing), so in theory one could interpret potential reviewer solicitation as a breach of confidentiality. My gut feeling would be to ask people with whom I am comfortable corresponding, and to be very equivocal about putting any other names forward (e.g. Dr. X is knowledgeable in the field, but I have no idea whether he has the time or interest to review the paper). Any suggestions? There is a recent technical note from NIST out describing potential IR hazards from off-the-shelf green laser pointers. It makes use of the CD spectrometer that I blogged about years ago, but is far more quantitative. It also shows a cool trick for detecting IR leakage from household lasers: evidently cheap webcams can see IR, while good digital cameras do not, so the images can be compared, to detect IR. More importantly, I think it is awesome that the federal government is encouraging people to set up physics experiments at home using paper cups, old music, and other stuff lying around the house. Take that, lawyers and stuffy nay-sayers! The technical note, "A green laser pointer hazard" is here. And a comparison of visual-only and visual+infrared diffraction image is below. The bright white dots are 808 nm IR leakage from the laser. This constitutes an eye hazard. Cordierite is a high temperature metamorphic magnesium-aluminosilicate. It is interesting because it contains no water in its structure, but contains large channels (see picture) into which water will readily bind, with up to about 1.2 H2O per formula unit (Mg2Al4Si5O18). Unlike most non-structural water, cordierite can hold onto water in this site under very high temperature conditions, such as granulite facies metamorphism. Because the water is not bound to a specific site, it has high entropy for a non-vapor phase, which of course explains the high temperature stability. It also leads to some funky phase transitions. Erroneous data with extremely low δ11B values were obtained during analysis of tourmaline from Lavicky granite and Altay pegmatite using an acid digestion technique and TIMS measurements. We thank Marschall and Ludwig for pointing out these problems. I've read a few comment-and-replies in my time, and I don't think I've seen an author ever thank the commenter for catching a mistake in the original paper before. The best one can generally hope for is mealymouthed mutterings about the difficulties of reproducibility, or grudging retraction. Can someone please give Dr. Jiang a civility award? And forgive his use of the royal "We".